The current version of Montgomery is vastly different from the pitcher that had been near the top every Kansas City Royals prospects list from 2009 to 2011. SAN DIEGO — Development doesn’t have a singular and unified direction in baseball. The path for position players and pitchers to reach the big leagues varies with turns, missteps, injuries, failures and reversals. It’s a journey that sometimes leads to nowhere. Even for a pitcher as talented as Mike Montgomery, there wasn’t a surefire formula that led him to Petco Park, where he will make his sixth big-league start Tuesday for the Mariners. He will pitch in front of his family and friends, who will make the short drive from Santa Clarita, Calif., to San Diego. “It’s always special to have them there watching me pitch,” he said. Considering Montgomery is left-handed, is only 25 years old and has a low- to mid-90s fastball, a plus changeup and improving breaking pitches, it’s not difficult to believe he would have reached the big leagues eventually. There was a reason he was a first-round supplemental draft choice (36th overall) by the Kansas City Royals in 2008 out of Hart High School. But the circumstances that finally brought him to the big leagues and the Mariners weren’t expected. Had it not been for Mariners pitcher Erasmo Ramirez being out of minor-league options, Montgomery might still be toiling in the Tampa Bay Rays’ organization, working on their decision to convert from starter to reliever. On March 31, his career took a turn. The Mariners and Rays swapped the pitchers in a trade. The Mariners put Montgomery in the rotation for Class AAA Tacoma. At the time, Montgomery was an addition to the team’s depth. The Mariners had set their starting rotation and had Roenis Elias waiting in Tacoma if needed. 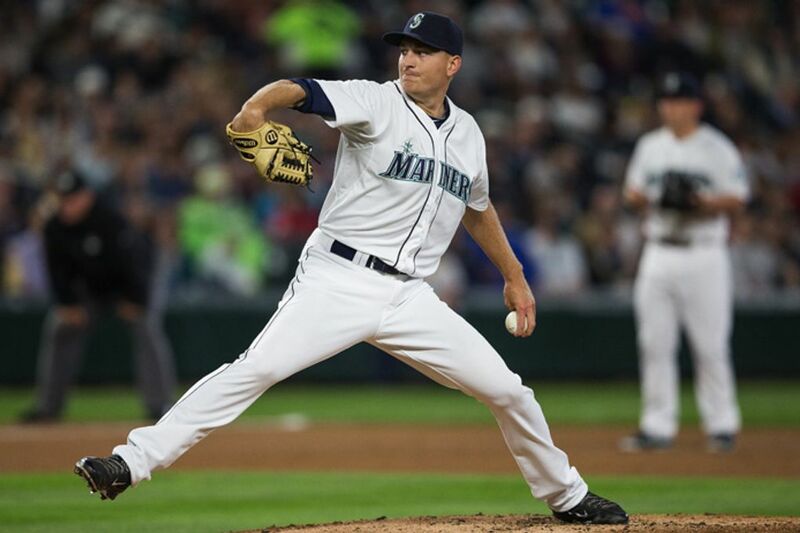 But with injuries to Hisashi Iwakuma and James Paxton, Montgomery was needed to fill a rotation spot. He’d been pitching well for Tacoma, posting a 4-3 record and 3.74 ERA in the hitter-friendly Pacific Coast League. In his big-league debut against the Yankees on June 2 at Safeco Field, he pitched six innings, allowing one run and four hits with two walks and four strikeouts. In five starts, he’s posted a 2-2 record and a 2.04 ERA. In his most recent start — against the Royals, the team that drafted him — he tossed a five-hit shutout with his parents in the stands. “That was a pretty special moment,” he said. And though shutouts come on rare occasions, that game offered a glimpse into the growth of Montgomery as a pitcher. In the first inning, the Royals loaded the bases with nobody out. But Montgomery came back to strike out his friend and former teammate Eric Hosmer and got Kendrys Morales to ground into an inning-ending double play. A younger Montgomery might not have been able to do that. But the current version of Montgomery is vastly different from the pitcher who had been near the top of every Royals prospects list from 2009 to 2011 before being traded to the Rays in the deal that sent James Shields to Kansas City. It’s an oft-heard transition. Montgomery went from thrower to pitcher. That enlightenment didn’t come with one inning or one outing. It came from a two-year stretch of getting beaten up by Class AAA hitters. After a 2010 season in which he dominated in four starts with Class A Wilmington (2-0, 1.09 ERA) and pitched well in 13 starts for Class AA Northwest Arkansas (5-4, 3.47 ERA), Montgomery began the 2011 season with Class AAA Omaha, and the big leagues seemed within reach. Many pitching prospects have suffered a similar fate at the Class AAA level, which features plenty of experienced hitters. And even that didn’t come quickly. Sometimes a pitcher’s stubbornness can be his greatest gift and biggest downfall. Montgomery went 5-11 with a 5.32 ERA for Omaha. In 2012, he split time at AA and AAA, posting a combined 5-12 record and 6.07 ERA. The two seasons of struggle and the trade to the Rays forced the understanding. “I was finally figuring it out, ‘OK, well if that doesn’t work, then I need to figure out what works,’ ” he said. So he started learning from others. He watched Rays starters David Price and Matt Moore. He studied them and asked questions. Montgomery posted a 7-8 record and 4.72 ERA with Class AAA Durham in 2013 and then came back with a 10-5 record and 4.29 ERA with Durham in 2014. It’s the same approach he’s taking with his status on the Mariners’ roster. He knows Iwakuma is nearing a return and he could be back in Tacoma despite his success. “It’s been such a short time,” he said. “I don’t want to look at these five starts and say, ‘Hey, I’ve made it. I’ve shown I can pitch here.’ I look at it more like, ‘How do I just continue to be on top of my game?’ I think to myself, ‘What do I have to do to be on top of my game?’ That’s really it.